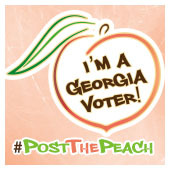 The #PostThePeach Challenge was initiated by a nonpartisan coalition of Georgia county elections officials and civic engagement organizations. The purpose is simple: to encourage all Georgians to exercise their right to vote, especially during the early voting period. We welcome partnerships with other Georgia counties and civic engagement partners. Contact us for more information. Vote early, Georgia, and #PostThePeach! We challenge all Georgians to Vote Early and #PostThePeach!